Soybean Aphid: The most common question I’ve had lately is “Where are the soybean aphids?” What started out being a good year for several species of aphids has certainly done an about-face. Based on reports from DATCP’s Wisconsin Pest Bulletin, conversations with crop consultants and county agents, soybean aphid numbers are down but not necessarily out. What we have in our favor is both time of the year and advanced crop stage. What we have working against us is temperature. A welcome return to cooler temperatures may positively affect aphid build up. Continue to scout fields over the next few weeks. The economic threshold is described as 250 aphids/plant on 80% of the plants AND the population is increasing. Increasing populations is an important concept of this economic threshold. It implies that a population that has plateaued at 250/plant for a period of time is not at an immediate risk for economic yield loss. To date, I have not heard of any field close to the economic threshold. Resist the temptation to prophylactically spray or to treat sub threshold populations. You may unintentionally flare twospotted spider mite populations and create a bigger problem than you had originally. 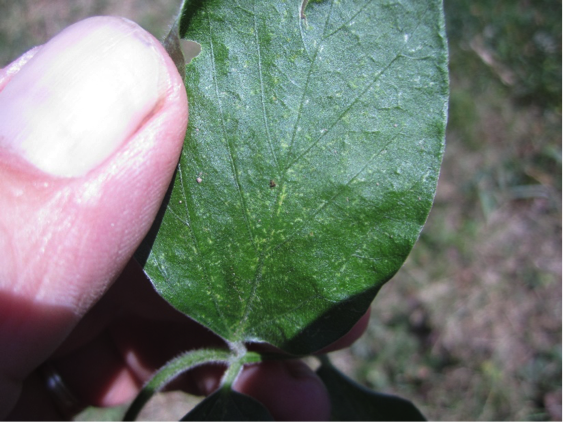 Twospotted Spider Mites: A comment that Kevin Jarek, UWEX Outagamie County, recently made regarding the dry conditions in northeast Wisconsin made me think about spider mites. Spider mites may become an economic concern after periods of hot/dry weather. Spot-check for mite activity on field edges, sandy knolls as well as other field areas that are drought stressed. Tap leaves over a white sheet of paper and use magnification to verify the presence of mites. Also, scout for initial signs of mite damage which are small white/yellowish specks on leaves which is often described as “stippling”. Don’t be overly alarmed if mites are present. Low numbers are common during most growing seasons and natural enemies (predatory insects/mites and pathogens) often aid with control. However, twospotted spider mite populations can increase quickly if field conditions remain dry and temperatures high. Also consider that unnecessary insecticide applications will control these natural enemies and lead to mite resurgence. Which is why care and thought needs to be given to spider mite and soybean aphid control programs. Japanese Beetles: Continue to check for adult feeding over the next 2-3 weeks. Adults are mobile and feeding may be isolated within a field. The economic threshold is to treat reproductive soybeans when 20% defoliation occurs.